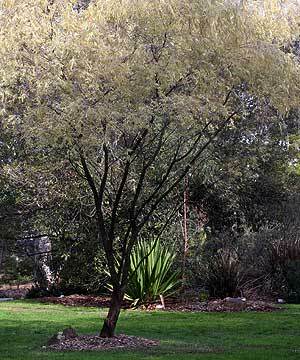 From Western Australia Agonis flexuosa is used widely as a landscaping tree and with new cultivars and improved forms available for sale they are well worth a look. Known as the Willow Myrtle it is available fro sale in a number of varieties with different growth habits and foliage colour. Popular varieties include, Agonis flexuosa nana (a dwarf form), Agonis flexuosa ‘After Dark’ and Agonis flexuosa ‘Variegata’. Agonis flexuosa (willow myrtle) is the tallest growing of the species, the other 3 are more shrub like. Small white flowers and a peppermint smell. Copes with poor soils and is reasonably drought tolerant. Taller growing Agonis flexuosa species will reach to 10m and are well suited to street and parkland plantings. They are drought tolerant and cope well with poor soils. The dwarf species Agonis flexuosa nana will reach 1- 1.5m and makes a great low hedge. White flowers in spring are an added attraction. Agonis flexuosa ‘Nana’ (Willow Peppermint) performs well in a sunny to part shaded position and needs a well drained soil..
Agonis flexuosa ‘burgandy’ with its lovely weeping habit has a mid burgundy colour most pronounced in its new growth. Flowers are typical of the species. Able to cope with poor soils as long as they are well drained, frost tolerant and excellent in coastal conditions. Agonis flexuosa ‘After Dark’ is a newer release again with beautiful burgundy foliage. These two will reach around 4m ( more or less depending on conditions) and both make excellent container or pot grown plants. A variegated form is also available. Leaves turning brown and dying can be caused by a number of issues on Agonis species and cultivars. Insects – Mites and Scale. The most likely problem is insect infestation. Check the foliage very careful for any sign of insects. The mites are very small so magnifying glass may be needed to actually see them. However the underside of the leaves become covered with a very fine web and you can often see the little clearish white eggs. Scale is like a fungus caused by insects. Often called ‘Sooty Mould’, usually you can see this on the underside of the foliage. Treatment for both is spraying with a Horticultural oil, (white oil) or Horticultural soap Natrasoap, on a cool day. Check with you local nursery for these and how to apply them. Spray from beneath the foliage as usually the insects are on the underside of the leaves.